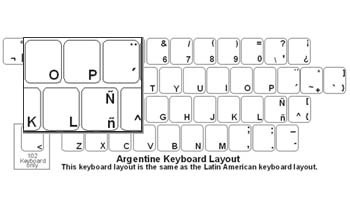 The DataCal Argentine (Spanish) language keyboard labels are a high-quality, durable and economical solution for creating an Argentine (Spanish) bilingual keyboard. This label set supports the Spanish language in the following countries: Argentina, Bolivia (Spanish), Chile, Colombia, Costa Rica, Dominican Republic, Ecuador (Spanish), El Salvador, Guatemala, Honduras, Mexico, Nicaragua, Panama, Paraguay, Peru (Spanish), Puerto Rico, Uruguay, and Venezuela. The label set also supports Quechua in: Bolivia, Ecuador, and Peru. The label set also supports K'iche (Guatemala).